How do you intend to reach your BJJ and fitness goals? Train? Think about training? Then Train more? Good start. But what are you going to train? When? Why? How much? With what frequency and intensity? How do you track your progress? Many people get stuck developing their personal program. I’ve written before about setting goals, and shared my own personal goals with you. BJJ is the primary “anchor” by which all of my other training goals will be hitched. My strength training, conditioning, mobility, flexibility, and other “puzzle pieces” all are intended to develop and enhance my strengths and shore up my weaknesses on the mat. Let’s start by laying out a potential week in my plan. The starting point to filling out the schedule is that I emphasize my highest priority items first. I will train BJJ or No GI minimally two times per week. I will also do two Strength Training and Metabolic Conditioning sessions each week. Those are non-negotiable. BJJ and No GI are usually on opposite days at my academy (M/W/F). Next, adding in my Strength Training (Su/Th) on opposite days and separating those workouts by at least 2 days gives me adequate recovery for my BJJ sessions and my other more demanding sessions of the week. The same applies to Metabolic Conditioning (Tu/Sa). I like to do them as a dedicated session to improve aerobic/anaerobic capacity and work on other important grappling attributes (carrying heavy objects, jumping, throwing, sprinting, pushing, pulling, etc.). After staggering these workouts in my week, I’ll add in all my other specific targets to work on. Because my target goals are complementary and fit together (like puzzle pieces) it makes sense to work on them together. I illustrate this below in the section about “Bundling” workouts. One tool I like to use is a weekly “Punch Card”. It’s simple and flexible and lets me prioritize my training. Here’s how I use it. As I mentioned above, BJJ, Strength Training, and Metabolic Conditioning workouts are non-negotiable workouts added to the template first and then I add and categorize the other target areas based on where they complement by primary focus area. I strive to complete all workouts (punch the card) in the first two columns every week. I target a minimum of two sessions a week to work on them. This should be enough that, over the course of a year, I am able to measure and see demonstrable progress. My main focus with this tool is verifying that I am completing my most important workouts of the week. Here is an example of my last week of training below. The last column is an “optional” column that I will use to enhance certain “feelings” I get when training. If I have a rare opportunity to squeeze in another BJJ session during the week, I’m going to do it and potentially take something else come off the list. If I find, for example, I am really experiencing rapid gains on my Deadlift (a goal of mine this year) and I want to prioritize my strength training even more, I can add additional optional work to that column and reduce (i.e., put on maintenance) or remove other items to reshape my focus for my goal. The bottom line is, I always try to accomplish the first two columns worth of workouts in my plan and I have flexibility to adapt my plan based on feedback from my body and whether I’m making progress toward my goals. In order to make the most of my training sessions, I prefer using two different techniques that are easy to implement: Bundling and Bite-sized workouts. “Bundling” is a term I use to simply refer to doing more than one thing within my training window. Workouts primarily center on one area, such as BJJ, Strength Training, or Metabolic Conditioning. Very rarely will I perform both types of workouts together, or on the same day. It has happened, as I like to experiment to see what my body responds to. However I often find my joints are too sore from BJJ training to put full effort into a Strength or Metabolic session. With at least 22 target areas to train each week, getting 4 checked off my punch card in one training session is a step in the right direction. “Bite-sized” refers to having a focused mini-workout to perform. I purposefully keep these sessions brief so my focus can be strong and reserve them for when I’m pressed for time (e.g., I have a 5-10 minute window). The beauty of these is that you can spread them out throughout the day and really accumulate progress if you stick with it. Grip work is a great candidate for these workouts. I often carry a few tools with me and use them throughout the day. I’ll sit in my car, in the office, or even in meetings and use these tools all day long. The Pinky ball is a great tool for working individual finger strength. It’s primarily an isometric strength tool (i.e., you’ll hold it for time as you fight the compressed rubber that’s fighting you back). Any corner store should carry these and they are as portable as it gets. A quick Google search returns many options. The captain of crush grippers are great for overall hand squeezing strength. They typically come in a set with increasing levels of difficulty. They will be hard to outgrow. Note: I have no affiliation with any of these products. Bodyweight-only work is also a good option to do in bites. 20 pushups and 20 squats performed every hour you’re awake adds up fast – you’ll log in hundreds of reps. Another option is isometric work. You can almost always find a door jam to push against or pull against from multiple angles. Ross Enamait of www.rosstraining.com has been a big proponent of these types of options, whether you are at home, in the car, in the office, etc. You can do work anywhere. You can see great examples from him at his website and in the video below. The takeaway is this. Your program shouldn’t be a box of loose and unmatched puzzle pieces. Use a few simple techniques to “anchor” your program, organize it, prioritize it, and put it together. If you have questions about details of my program or your own program, leave them in the comments below, email me at heavyweightbjj@gmail.com. “What people fear is the unknown and what they don’t know or don’t understand”. As my coffee was brewing, I sat on the couch for a few minutes and surfed through all of my social media feeds looking to see what was going on. I found inspiration from this video clip in my Facebook feed this morning by none other than Wheaties. It was one of the few videos I’ve watched all the way to the end, usually opting to fly through the feed quickly. James C. Hawkins story was captivating and was a story that I wanted to share right away. He is a Karate Black belt, a Veteran, an Executive. He has had 3 battles with cancer and won them. He has endured incessant racism for a large part of his life. In a school of 450 kids, he was the ONLY non-white minority in the whole school. He had a fight every day after school for the first 90 days. When he moved to Massachusetts, he and his wife had a coalition built against him by their next door neighbor, night time phone calls, etc. for 30 days of hell. He later became close friends with the same neighbor. James Hawkins has words of wisdom from his life that he shares. This is what resonated most with me. This man is a true champion. Through the training of martial arts and the lessons learned in training sessions, the discipline you develop to accomplish or to restrain yourself allows you to get through every day with a clear slate rooted in knowing you did everything you could to improve yourself. His life is exactly the mission of advancing human potential through Hard Work, Heroic Will, and living a life worth following. Human potential. We’re all born with it. Untapped. What are our limits? What is the extent of our capabilities? Where are the boundaries? Do we really know? Do they exist or are the artificial? We’ve been testing it since the beginning of time. To some, we are only scratching the surface. People without vision love to dictate to others to validate their lack of initiative, effort, and results. Misery loves company and mediocrity does as well. Yet there are so many examples around us of people who do and achieve things that seem “impossible”. People who “beat the odds”. People who refuse to lose. Were they born with this confidence? Well, if you’ve taken the time to be honest with yourself and take a hard look at where you are and where you want to go, then you’ve answered this question. However, as easy at it seems for some, it is just as difficult for others to get out of their own way. I believe in order to “find” yourself, you have to be willing to step into uncomfortable territory and perform outside of your comfort zone. You should not be avoiding the training situations that develop your flight or fight response; we should seek them. I’m not saying you should be a high-risk taker. Read these words carefully. That’s how we develop our main character traits. That’s how you develop your identity. That’s how you develop your soul. Everybody seeks to figure out who they are. Figuring out what we are good at, what we have a “natural tendency” towards, is something every curious human being should be doing. Your soul is the ‘root system’ of your being. Whether you have heart, or you don’t. Some of these traits you have an affinity towards (i.e., you’re born with them). Others you need to coax and fight with stubbornness to develop. But when you develop them, you make your soul stronger. You create your identity. You test them every time you test yourself: physically, mentally, spiritually. Expanding on your basic understanding of what your capable of. You feed it through self-reflection, and building confidence. Through building your strengths and smashing through your weaknesses. Confession: I have had many self-doubts on my journey. Especially after having to take a longer-than wanted layoff from training. I’ve even turned my car around and gone home after getting to the Academy. What doubts/fears was I facing? All of them pointed to my EGO being bruised. Being big and strong for most of my life, and realizing that was not the “answer” on the mat. Doubt in my abilities to be resilient, survive getting smashed, my cardio, facing physical pain, etc. Stop Overthinking: I re-wired my tendency to overthink things. When my excuse machine turned on in my head on my way to the Academy, I ignored it. I literally told myself to shut up. Audio Stimulation: I blasted upbeat music to lift my mood up. This helps distract your brain if you have a tendency to overthink things. Heavy metal, Pop, Rock – whatever got my mind occupied and stimulated to feel energized. Face your Fears head on: I faced everything I was running from. I went towards the “discomfort”. Move Forward and Don’t Look Back: When I walked through the Academy doors, I took the stress off by deciding I didn’t need to “win” anymore. I needed to survive, defend, and escape bad spots. This accelerated my learning. Compete With Yourself: I stopped comparing myself to others progress. This only fueled the wrong flame. The first time you decided to go into a BJJ academy was a pivotal step towards this self-discovery. Perhaps the most recent time you put on a Gi to train, you’ve had an internal discussion with yourself about what you want to work on or avoid. Testing your willingness to accept being the nail to someone’s hammer. It takes a special person to enjoy getting physically handled, punched, or kicked as practice. What are other times you may have this dialogue? Every time you decide you’re going for a new Personal Record (PR) in the weight room, you are testing yourself. What you are made of. How bad you want it. Every time you put on your shoes and get ready to do some drills or conditioning work, you are testing yourself. Every time you decide to do a new yoga stretch……………okay, maybe not that one. It requires discipline and dedication. Prepare yourself for daily battle. Face your fears. Reflect. Improve. I call this Consistent Persistence. In 3 Tools to Improve Your Training Program, I covered the concept of “anchoring” your training to your primary focus area (i.e., BJJ) and making your program puzzle pieces fit together to help you achieve your most important goals. One concept I didn’t discuss was the actual exercise selection for your workouts. One thing I make an effort to do is select an exercise that has a multi-purpose/multi-function benefit. Not unlike the trusty Swiss Army knife, the exercises you select for the job are versatile and can accomplish various tasks depending on your goals. Let’s walk through it. Improve overall athleticism by practicing athletic attributes like jumping, throwing, sprinting, punching, etc. Improve motor-unit recruitment to help in maximal strength training workouts (i.e., train fast to be fast and explosive and to move the weights fast). Improve lactate threshold and VO2 MAX (fancy way of saying improve capacity to deal with “the burn” and body’s ability to use oxygen). If I can accomplish one (1) of these objectives with my MetCon workouts, I’m happy. Luckily it’s easier to meet more than one of these objectives with your workout than you would think. Something as simple as a 100m sprint can check off many if not all of these objectives. Now, the next important step that adds the icing to the cake, is that I try to select exercises that will also help me improve on my specific focus areas for the year, which are BJJ, Strength Training (i.e., the Deadlift), Mobility, Core, Grip work, and Flexibility. There are many options for conducting MetCon workouts (e.g., As Many Rounds/Reps as Possible or AMRAP, Reps for time, timed intervals, total # of reps, total distance covered, timed circuits, compound exercises, etc.). Here is how my last workout looked. 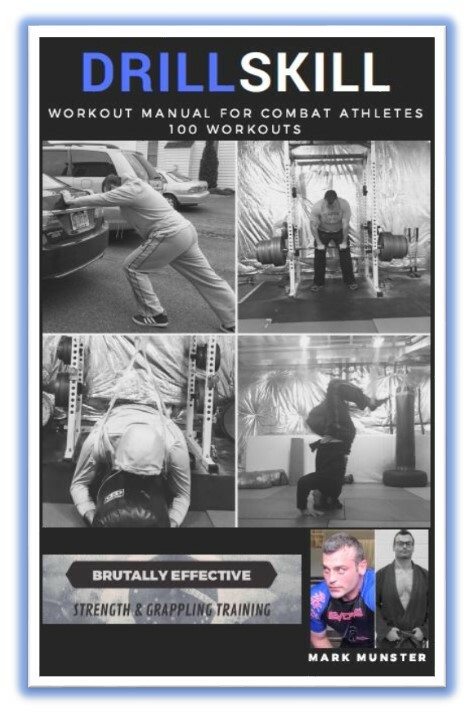 I’ve also included a brief video below to demonstrate the exercises. If I can check-mark two or more of my target focus areas with one exercise…..SCORE! All I am doing is making a small modification to certain exercises to link them closer to the demands and specificity of BJJ. An example is the Sprawl + Jump. I could have easily selected burpees for that exercise, which as a brutal conditioner and athletic movement. However, adding in the Sprawl will force me to practice the move that so often comes up on the mat to defend a takedown attempt. Any chance you have to practice, you should. Another example is that I could have performed all of my core exercises by hanging from a bar. I chose to do them standing while bearing weight. Moving the weight away from your body creates a similar engagement of the core as you would encounter during grappling a standing opponent and perhaps fighting for underhooks. Are there better options? Sure. You have to make modifications to the tools you have at your disposal. Tire slams are a great way to generate power and transfer energy from your feet through your body through the object. Anything that starts with the feet as the catalyst and ends with the hands releasing the energy (essentially most combat sports and other sports) is a great exercise. Standing up in the guard and removing grips often requires the coordination of these muscles and athletics attributes similar to this. Heavybag combos helping my BJJ? How often do you need to close the distance on your opponent to clinch and takedown? Plus, it’s just fun hitting things and generating that expression of power output. I hope this helps put a perspective into making minor modifications before your next workout to help you reap even greater benefits and accomplish more of your goals. Overall, remember that doing anything over nothing is best, so keep it simple and avoid analysis paralysis. It’s time to recommit to your plan to dominate. We all start out strong each year with motivation to do better than we had in the past year. But how many of you are putting thought to what you want to accomplish, and exactly how you plan to accomplish your goals? If you aren’t putting thought into it and coming up with a plan, you’re on the wrong end of the goal-setting wall. You’re either in front of it with tools to tackle it, or you’re stuck behind it with no plan to improve your spot. If you actually blow past some of your goals before the year is out, by all means set a new ceiling. The sky is the limit, but make sure it meets the SMART criteria above. Strong foundations are built brick-by-brick. Five quick tips for you to remember as you start out the year trying to build a better you. Plan ahead: You must have the discipline to log your workouts, make your meals, review your journal, get adequate sleep, etc. If you begin to drop the ball it’s human nature to continue the momentum you’ve gained and “start next week”, or do something drastic like change your whole plan to make it easier. Do yourself a favor and make a journal (notebook, smartphone, iPad, apps, whatever. Get in the discipline of making your goals and sticking to them by documenting your daily activities and mental notes. It’s human nature to throw in the towel when you drop the ball, but don’t be weak. Plan ahead and avoid this issue. Think bite-sized chunks: You’ve probably heard “Rome wasn’t built in a day”, or “Don’t try to eat the whole elephant in one bite”. In order to accomplish your goals you need to know three things: Your current baseline, your target goal, and a roadmap to get there. Making the roadmap can sometimes be where folks lose it and will rely on “willpower” to drive them. As my good friend Philip Chubb says, “Human willpower and drive is a finite resource that has to recharge”. As an example, let’s say you’ve never trained BJJ before, and your goal is to not only to start training, but to compete as well. That’s great. You should ask yourself, “What do I need to do before I should even consider doing this?” Well, you’ll need a Gi, an Academy to train, an idea of your weight class (which can likely mean additional conditioning and dietary changes for weight making/maintenance), target tournaments, a target date for your first tournament, and honest feedback from your coaches and training team on your readiness. Now, all of this doesn’t unfold on its own. Finding a suitable Academy can take you weeks or even months until you find a match for you and is a sizable “chunk” towards achieving your goal. This may seem like common sense to many of you, but don’t overlook the simplicity of this. Don’t let your eagerness turn into neglect for mapping out your path to success. Be honest: When you track your progress, be honest with your self-assessment. If you achieve something (sort of), and you are second guessing your accomplishment, re-evaluate the achievement or the goal itself. Maybe your progress indicators were flawed or your goal wasn’t specific enough. Don’t take shortcuts. Instead, claim small victories. They accumulate over time. You’re in Control: If you’re a white belt, of course it’s natural to set your sights on the Blue Belt. However, making this a goal in weeks, or even a year may not meet the test of being Realistic, because it’s out of your hands when you get promoted. Instead, focus on certain elements of your BJJ game that will improve your standing as a White belt, such as working on survival tactics against higher belts. You can work on this every time you roll in class. The less times you get tapped, the more you are improving. It meets the SMART criteria. You can also increase the likelihood of improving your skills with more mat time. So make sure you attempt to get to class a minimum of 1 time per week, then 2, then 3, etc. You’ll have to decide, but make the activities to achieve your goal something you can control and reasonably and consistently perform. Stay Positive: Your mindset needs to be glass-half full…always. There is no room for negative thought when your goals are on the line. Remove the negative thoughts like doubt and pity from your dictionary. Excuses are irrelevant. You’ll only be fooling yourself with excuses. No one cares why you’ve missed a workout, or why you can’t eat right, so don’t waste your breath telling everybody. Just evaluate your options to get back on course and keep positive momentum moving forward. You’re equipped with the most powerful analytical tool that we know of: your brain. Use it to build a positive mindset and get to your goals. Period. When sitting down to think through my physical development goals (the focus areas of HWBJJ) for 2016, I already know, based on my 2015 goals and progress, what I want my goals for 2016 to be. It helps to know where you’ve been, what you’ve done, and where you want to go. If you’re starting off for the first time, you have nowhere to go but up. Next, I spent time asking myself whether the goals were specific and realistic enough, how I would measure and track my progress, whether I could achieve these goals within my time-frame (i.e., the SMART criteria). I plan to follow my goals for the entire year, so my ability to track progress, make adjustments, or even add new goals, will be a critical step in this process. Personally, I track my goals in a journal (my laptop) and my smartphone so it is easy to refer back to and evaluate. Learn how to establish your goals here. Top of the Heap: The Heavyweight is KING! When I was a kid (’70’s – 80’s), being a “Heavyweight” (HW) has always been linked with being the best, biggest, or baddest person on the planet (or kid in school, in town, on the sports team….you get it). There has always been a fascination with big versus small, with the idea that bigger always triumphs over small [insert David versus Goliath]. Whether or not you believe the factual accuracy or outcome of that story is irrelevant (I doubt a pebble took him out). The point I’m trying to make is that there is an intrinsic fascination associated with the HW athlete, persona, or individual, whether it be Goliath, Tyson, Fedor, Lesnar, the Incredible Hulk, Hulk Hogan, or even Big Bob Sapp (look him up – he’s huge in Japan). I started lifting weights at the age of 13 after seeing Arnold Schwarzenegger in a copy of Muscle & Fitness talking about being Mr. Olympia and how he used to lift weights in the woods for hours and hours and cook over an open fire like a caveman. His drive and determination were magnetic to me. I spent countless hours in my cousins attic in the summer months and even more during the winter months lifting weights, experimenting with exercises and enjoying the pain brought on by the weights. The changes to my body and my strength levels were addicting. The power, confidence, and goal-setting mentality I obtained from lifting weights was something I couldn’t get enough of. To this day it is a cornerstone of who I am, over 28 years later. In 1991, Mike Tyson convinced me boxing was the superior art form to study, and I was naturally drawn to the boxing-style workouts of road-word, jumping rope, heavy bag work, speed bag work, and sparring. The ‘peek-a-boo’ style of boxing that Cus D’Amato and Kevin Rooney trained him in was elusive, different, and destructive to opponents. Having both feet planted in a staggered, squared-up style allowed Mike to showcase the power of his hooks and uppercuts in a way that has not been duplicated since, in my opinion. The other allure to this style are the workouts and training. They are intense, difficult, and just what I needed to add to my toolbox. I continue to work in boxing based workouts to this day. Fast forward to 1993 when I fell in love with Gracie Jiu-Jitsu (GJJ)/Brazilian-Jiu Jitsu (BJJ). Royce Gracie had proven, at UFC 1, in the ring of combat (actually the octogon) that the bigger man, and even technically skilled practitioners in Karate, Savate, Boxing, Judo, and Muay Thai, were no match for his ground-based/grappling martial art. He repeatedly closed the distance on them, applied ground pressure to get the opponent to react/make a mistake, and secured a submission by way of choke or joint lock. It was mystical to watch to me and countless others. Even the commentators had trouble doing play-by-play to describe the fights unfolding with Royce, often, on his back in the Guard. It was the spark to the flame in my and countless others martial arts journey. NOTE: The history of BJJ is a great story, and you should know it if you train it. To sum it up (a lot), Helio Gracie developed a style of fighting [rooted in Judo and Japanese Ju-Jitsu], incorporating leverage and fighting off his back (the Guard), to deal with larger and stronger opponents. BJJ, as a fundamental form of self-defense, teaches smaller practitioners to survive and even defeat larger opponents in confrontational scenarios that end up on the ground; EVEN while fighting off of their back. That is one of the many reasons BJJ is so different from the other arts and is well-suited for smaller, weaker people of all shapes, sizes, and age. The laws of physics and anatomy don’t change. If you train BJJ, you are probably already well-aware of this. I put on my first Gi in 1997, when instruction and anything beyond a blue belt was as scarce as leftovers in my house. Three career changes, two moves, a marriage, and my first child later, I found a home to train in 2007 at Evolve Academy of Martial Arts, where I am currently a Brown Belt under Master Mike Moses. While I continue to strength train and use various conditioning workouts that include boxing and thai boxing styles, BJJ is my main passion by which everything else is anchored. Fatigue will happen if all you use is strength, and you’ll get swept or submitted. When you are a white belt, this is the only reaction you know, because you fear the unknown. It’s very humbling and “ego-checking” when you are starting out if you don’t deal with it up front and every time you train. Remember that BJJ was created to work for anyone, regardless of age, size or strength. I will share with you how I’ve dealt with and continue to deal with this and other problems during my training inside the academy. I’ll also share with you the power that JiuJitsu has to make you a better person. Our goal, with HW3 JiuJitsu, is to promote being a better human through hard work and heroic will. Being a better human in all areas of life can give you the tools to leave behind a life worth following; a Heavy Weight legacy. We want to showcase these stories; YOUR stories, on how JiuJitsu has made you a better person. Continue reading through the articles on this site and we hope you find something that “clicks” with you.